Absolute beginner on bonds, trying to understand why spot rates seen for US-T don't seem to line up with CME futures for ZT/ZB/etc at their maturity. For instance, ZB-U8 seemed to settle at 140-27 on Sept 19th of 2018 (that was the last trade price according to my provider; don't have exact actual settlement). 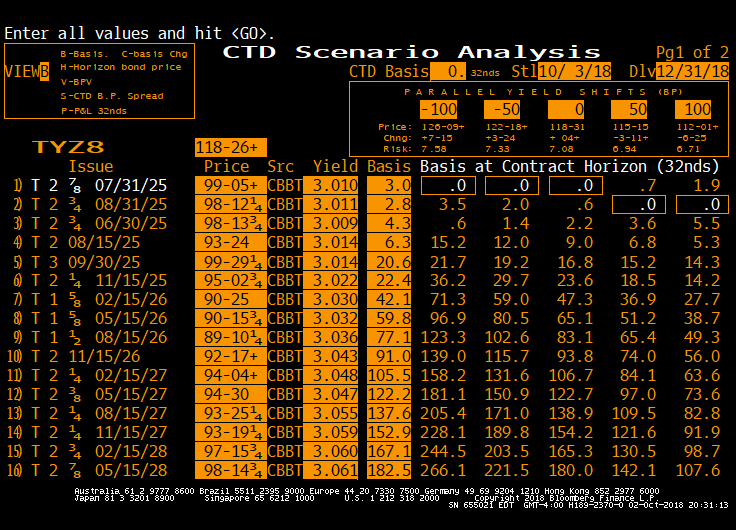 A Yield-To-Maturity calculator, with 100K par and 6% coupon, 30 years to maturity with bi-annual payments, suggests the hypothetical ideal 1.00 Conversion Factor short delivery would have an effective yield of 3.73% at this price. But on Sept 19th, CNBC reports the intraday 30 year spot US treasury rate was no higher than 3.16%. What explains the more than half a percentage point rate difference that futures traders are getting by settling into the security at end of last trading day rather than buying the bonds outright? Responders to date have been most helpful; I believe I am zeroing in on my confusion. Marking this a duplicate of "How do I calculate yield from a bond futures contract?" leaves I think one crucial point unclarified: a "How" answer doesn't answer a "Why" question. The Bloomberg screencaps in the one answer were useful, but also still leave a bit of a question mark. The fundamental issue in the initial premise is that using a Yield-To-Maturity calculator with the assumptions I was using (30 year, 6% coupon, etc.) seems to be incorrect, due to the intricacies of how the Future is settled - instead one needs to look at the effective yield-to-maturity of the cheapest to deliver contract (as one option of valuing the future's yield, anyway). But then (A) why don't the conversion factors of the various constituents of the basket of bonds eligible for delivery bring their yields closer to parity, if the whole point of the conversion factor in the first place is to make them interchangeable for delivery, and (B) why do all of their yields seem to differ so much from the yield-to-maturity of the theoretical bond represented by the future's price and contract specs (e.g. ZB=30 years, 6% coupon); or relatedly why does that theoretical yield-to-maturity vary so widely from the cash bond's yield-to-maturity. For both (A) and (B), I'm asking specifically about on the day the future is expiring (so there's presumably no contango effect)? The conversion factor isn't 1.0 ever for these. For example, today TYZ8 settled at 118-25. The conversion factors range from .83 to about .78. So the equivalent for the cheapest bond is basically 99-05 . That gives a 3.01 yield. I can give you some screen shots from Bloomberg later if that would be helpful. You can see that the CTD is way different than 1. This conversion factor will not change over the life of the contract. 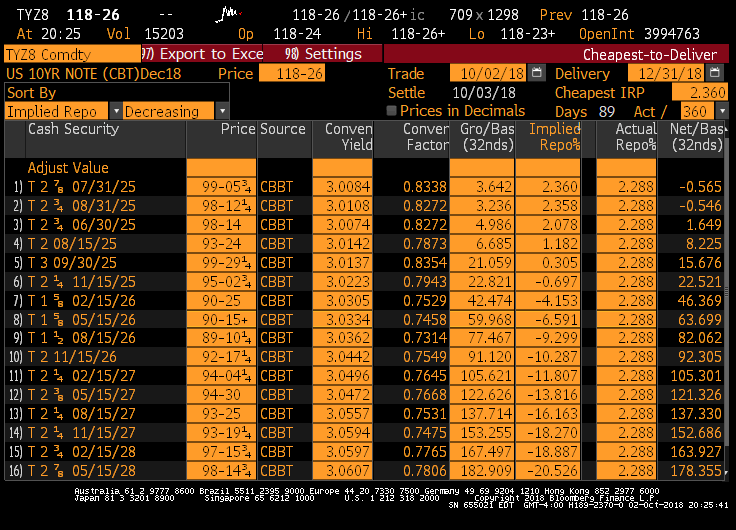 Now, you can see here that the July 31 and Aug 31 2025 notes are the cheapest to deliver to the point where they are almost indistinguishable from each-other. But, the Jun 2025 note is very close too, so the price of the TYZ8 will reflect the slight possibility of getting that note as well, which is worth a few ticks more, but has basically the same conversion factor. Not the answer you're looking for? Browse other questions tagged fixed-income bond-futures treasuries or ask your own question. How was money made from bond yield convergence?